Breaking Bit, 5" Copper Mouth, Chrome Plated 6" Cheeks For Young Intermediate Horse (Moderate Effect) Imported. A great bit for training often used as the first step after a snaffle. 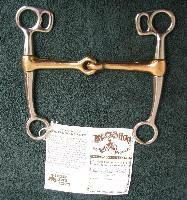 Stainless steel cheeks Tom Thumb Breaking Bit, 5" Jointed Copper Mouth, 6" Cheeks For Young Intermediate Horse (Moderate Effect) Imported. A great bit for training often used as the first step after a snaffle.